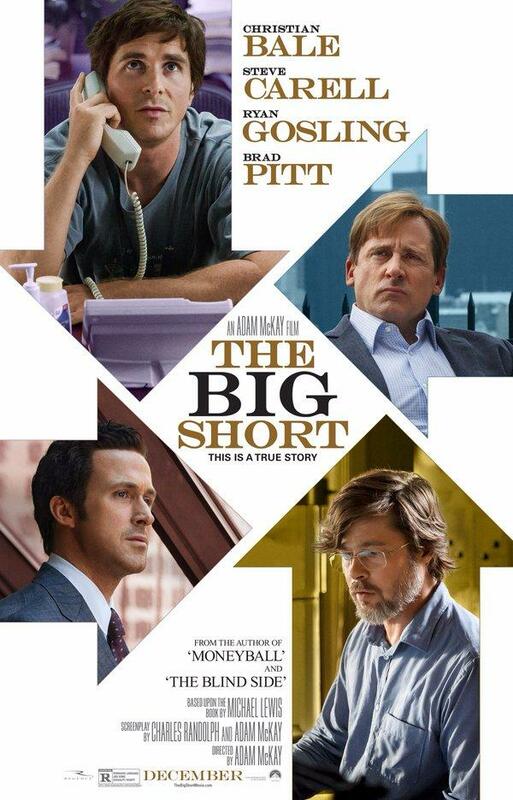 The Big Short – This is a true story! Screenplay by Charles Randolph and Adam McKay. The Big Short follows the story of some investors who shorted against the U.S. Housing Market. They were betting that it was all a bubble that was about to burst. Michael Burry (Bale) runs Scion Capital and he has figured out that the mortgages held in all of these CDO investments are mostly bad loans. He approaches several banks about creating shorts against the housing market and they all grant him what he wants, because they all think the housing market will never fail. Jared Vennett (Gosling) hears what Burry is dong and he checks out the housing market and realizes Burry is correct. Jared makes a call to the wrong department of a firm and they become interested in the idea. Mark Baum (Carell) sets up a meeting with Jared and they work a deal to short the housing market as well. Meanwhile, two young men Jamie Shipley (Wittock) and Charlie Gellar (Magaro) have created a thirty million dollar fund, which started with just over one hundred thousand dollars. They find a flyer created by Jared Vennett and they become interested in the subprime mortgage failure. The story follows all of these investors through the crisis as they all profit from the collapse of an economy. This movie will probably confusing to most people who don’t understand finance, but that is why this movie is so important. Adam McKay (Co-writer and Director) is trying to bring to light the incredible fraud on the American people, which affected the entire world’s economy. The people responsible did not care that they were stealing from investors, pension funds and people’s retirement savings. I had heard of one pension fund that had lost so much money that payouts were going to be one third of what they should be. So, if you were expecting $1800 a month for your pension you would only get $600 a month. The people in the banking industry pocketed billions and regular people had their retirements ruined. Now to put this story onto a movie screen is risky business. First the technical jargon won’t be understood by most viewers, and that is why they had Margot Robbie in a bubble bath trying to educate the viewer on sub prime mortgages. Will anybody remember what she said? Selena Gomez and Anthony Bourdain also take turns explaining different types of jargon to us viewers, each time I think it distracts us rather than helps us. Yes, it is done in a fun way, but Brad Pitt’s character puts this all into perspective when he chastises the two young investors for doing a happy dance after they make a deal. He tells them that they just bet that the economy will collapse and you are dancing because people are going to lose their jobs, houses, and lives. The performances from Steve Carell and Christian Bale are the definite highlights of this movie. They both play socially awkward individuals both trying to deal with personal problems in the middle of an absolute financial hurricane. I think both performances by Finn Wittrock and John Magaro show that they have bright futures ahead of them as actors. Marisa Tomei did a great job as Cynthia Baum by prying at her husband to finally have a reaction from a tragedy in his life. Unfortunately, this movie just does not translate well to the big screen. CC Rating: 4 out of 10. Directors’ Previous Movies: Anchorman, Talladega Nights, Step Brothers. If you liked this try: Wall Street, Boiler Room, The Wolf of Wall Street.